Laboratory Ovens are suitable for a variety of heating and drying applications in laboratories and in industries. They are used for sample drying, evaporating, heat treating, sterilizing, parts drying, annealing and testing. We offer standard oven temperature of up to 300°C (550°F), and capacities from 20 liters (0.7 ft.3) up to 2200 liters (80 ft.3). Economical Gravity Convection ovens are used when the temperature uniformity is not critical or when mechanical forced air convection would affect the sample. 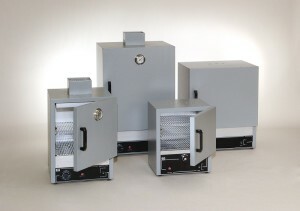 Air Forced Circulation Ovens, or Mechanical Convection Ovens, offer a more uniform distribution of heat throughout the chamber, which also facilitates evaporating. They also reduce required time to reach the operating temperature. The Laboratory Ovens can be supplied with an economical Analog Temperature Control, or with a PID Digital Temperature Control that greatly improve temperature uniformity. Large Capacity Bench Ovens: capacity 450 to 1000L (16 to 36 ft.3), max. temperature 204°C (400°F). Also available Walk-In Ovens and High Temperature Ovens.